Mumbai is a food-lover’s dream for sure, but I don’t think that many of us know that we can combine food and travel very effectively in Maharashtra. Between the goodies yielded by the Konkan stretch, along with renowned dhabas and seafood, we love heading out of the city for a very nutritious break. Here are the ones that we checked out and came back fattened by. We head to Talasari to eat at Parsi Da Dhaba, an iconic restaurant along the Maharashtra-Gujarat border. This is an easy drive, and we also like heading to the isolated Kurze Daam for a post-lunch snooze. Parsi Da Dhaba is best enjoyed on an empty stomach, so we usually opt for a very light breakfast. The chicken farcha and salli boti are our favourites. Vegetarians, try the paneer salli. Don’t forget the dudh nu puff: it melts in our mouths. They also serve drinks here, for those who aren’t in the driving seat on the way home. Next to Parsi Da Dhaba is the legendary Parsi Dairy, where we pick up toffees and try their epic allu wadas. The two-and-a-half hour drive to Talasari is a straight one via the NH48. They operate between 7 AM and 11 PM. The Crazy Crab Restaurant in Dahanu is worth our time. 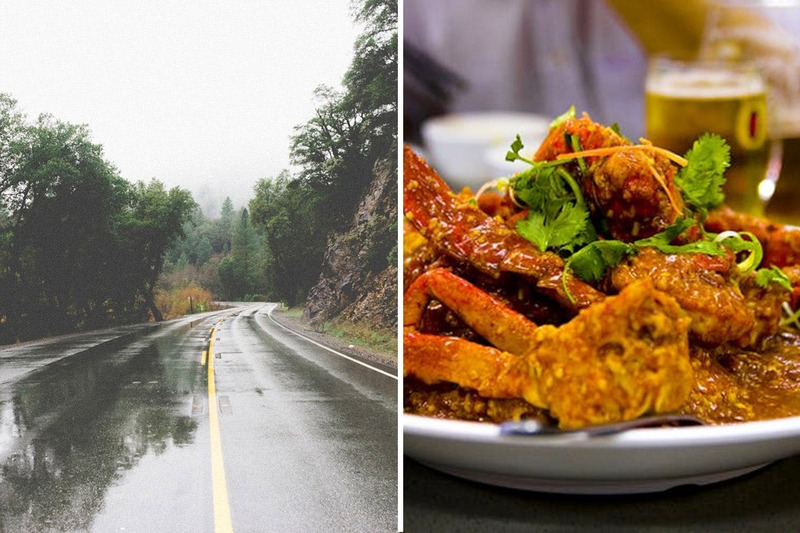 It’s a great drive which culminates in a sea-facing restaurant. The crab, obviously. The serve alcohol as well. Bonus: they have a pretty impressive vegetarian spread too. A post-lunch visit to the Dahanu Beach is totally worth it. The beach hasn’t been hit by commercialisation and is a great place to watch the sunset and digest lunch. Dahanu is a two-and-a-half hour drive away along the picturesque Sahyadri mountain ranges. They operate between 11 AM and 4 PM for lunch. This is an epic road trip for a seafood lover, since we can explore the cuisines of Malvan, Sawantvadi and Kolhapur regions. We have tried everything from fresh seafood to mutton cooked in spicy gravies. The style of cooking is different for each one, and there is something even for vegetarians, though they shouldn’t expect too much. Hotel Opal, right off the highway, is definitely our first stop. The mutton served here just melts in our mouth. Solankis nearby is famous for the their cold milk drinks, and we’ve lost count of the drinks we’ve had here on more than one occasion. For typical Maharashtrian fare, we have the famous Shyam’s Vada Pav (call on +91 97304 01366) or the missal pav at Phadtare’s. Dinner is usually at the Padma Guest House, the restaurant of which has acquired local celebrity status. We like to stock up on Kolhapuri chappals from the main market. For a more authentic purchase, try the stitched versions, not the glued ones. The route is via the super-fast NH48, and we can reach Kolhapur for lunch if we leave early.